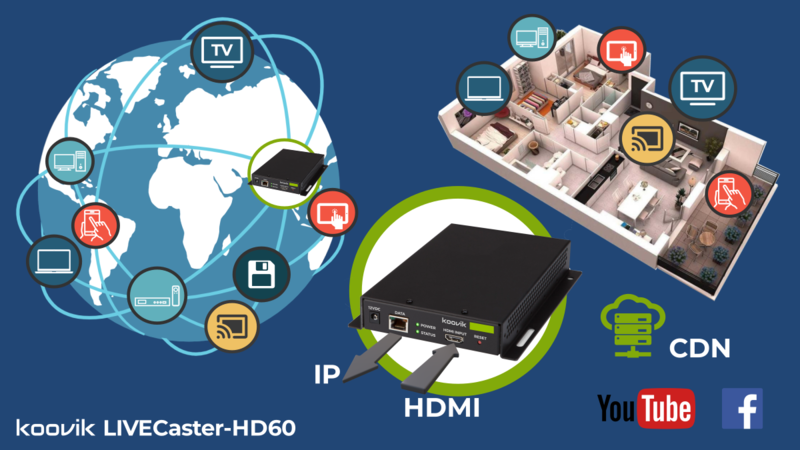 A reliable, high-performance HDMI over IP encoder and streamer to transmit up to 1080p60 over local standard Gigabit Ethernet, public internet, publish on social networks like YouTube and Facebook Live, or/and cast stream to Chromecast or google TV devices. Watch on IP Set-top boxes, TVs, Computers, Smartphones, Tablets, Chromecast, Digital Signage screens, etc. Share true HD live video with your friends over the public internet. Record films, programs or events. 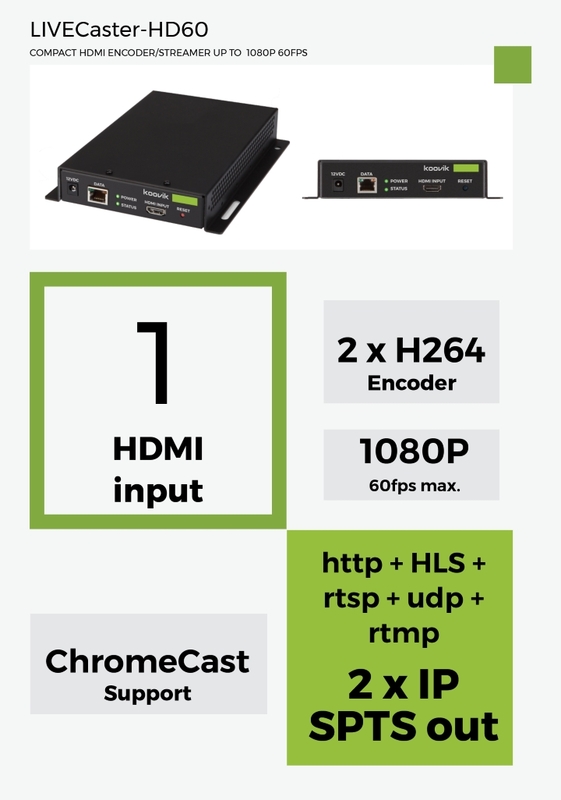 VIDEO CODEC 2 Independent encoders. MPEG4 AVC H.264. High, Main, or Baseline profile. INPUT RESOLUTION Up to 1080p 50/60fps. Progressive or interlaced. BIT-RATE 0.5 Mbps to 8 Mbps. CBR or VBR. Independent per each stream out. HLS Link HLS link to watch video in internet browser. Map to public IP address possible to share content over public internet. CHROMECAST Link to cast video to your Chromecast device on local networks or public internet. power Supply Switch Model. Separate Module. Universal Power Supply (100 to 240VAC, 50/60Hz). Out 12VDC 1,5A max. Included 1 x power supply. 1 x HDMI cable.